Hello, some questions have come up what I write in my Czech blog. So this is for you who cannot read my books and facebook statements in Czech but still somehow (thank you so much) remain my firm friends and supporters. 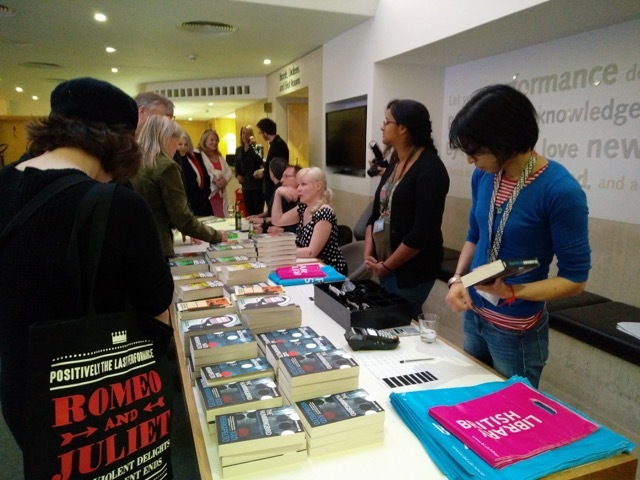 I reported that I went to an event in London called European literature festival in The British Library. I thought that for change it would be nice to hear about something European in a positive way. Barry Forshaw, an English expert on crime in literature and films hosted a panel discussion called Criminal Worlds and talked with a Finish author Kati Hiekkapelto whose detective Anna Fekete, a Hungarian immigrant, tackles crime in Oulu (North Finland). Her second novel translated into English with a tittle The Defenceless is out now. Volker Kutcher’s (German) detective inspector Rath operates in Berlin in the 1930s, the most tragic times of the German history. His book Babylon Berlin in which, according to his own words, he puts a lot an emphasis on the description and psychology of characters, will be available in English on 19 May and will become a crime series directed by Tom Tykwer (Run Lola Run). Then there was the famous Peter James from Brighton who I don’t need to introduce. By the way, he became a crime novelist after his house was burgled and the investigating detective became his friend. Peter James is also a car racer and full of funny stories. Kati described the funniest story of all though. Public literary readings are extremely popular in Germany and some of them take place in public (and mix gender) sauna. Well, even a Fin found it a little awkward to read her book in front of naked audience. (I would put a link to some pictures from the event but couldn’t found any). What an experience!